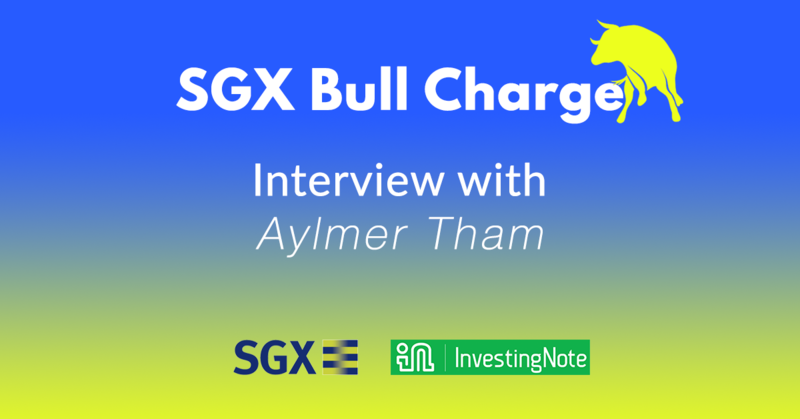 We're very close to the finale of the SGX Bull Charge Stock Challenge! Recently, we got in touch with @aylmertham, to understand more about his investing strategies, his philosophy, and what motivated him to get started in the first place. In 2012, I was the winner in the Stockwhiz Investment Competition in the Professional level for the ETF Category in Sep 2012, beating all other Professionals in the Finance Industry participating in the competition. For the past few years, I have been specialising more in the US market. 2. What type of trader or investor would you say you are? I am a hybrid trader, looking at both fundamentals and technicals, with slightly stronger emphasis on technicals, due to my strength in it. 3. What are your best investment and worst investment since you started investing? Best Investment: PulteGroup Inc. More than 2000% gains in the long dated call option (2011-2012). There is no worst investment, as every mistake made is a good lesson learnt that will pay off in the long run. And yes, I made a lot of mistakes, but because of them, I can trade much better today. 4. Do you have an idol in investing or trading? If so, what’s the most memorable teaching from them? Not exactly idols, but I enjoyed the Stock Market Wizards series by Jack Schwager, and all the fund managers interviewed in these books. They are a good read. Also, Sun Zi Art of War. My way of managing trading and investment is partially influenced by them. 5. Do you have any rules to stock picking? I look at both technicals and fundamentals for pickings the stocks to watch, with entry and exits determined by technicals. There is no constant best stock, only stocks with current potential (upside or downside), stocks looking overvalued, stocks looking undervalued. A stock with seemingly weak fundamentals, getting really oversold beyond its fundamental justification, becomes a stock that is undervalued, and potential for rebound, and vice-versa. This is a fluid concept investors must understand. 6. What do you think of the current market conditions in Singapore right now? Right now, there is a divergence between US markets and Hong Kong markets, with Dow Jones Industrial Average Index making a new all-time high just 3 days ago, while Hang Seng Index (HSI) has made a new year’s low today, off more than 20% from its 52-weeks high, and into bear territory. Straits Times Index (STI) is caught in between, and is trading more in sympathy with our regional neighbour Hong Kong than US markets in the past few months; however, STI did not make a new year’s low unlike Hang Seng today, displaying the local market sentiment that it is being “sandwiched”. The divergence is unusual; going forward, either US Indexes will break down technically (and follow Hong Kong and Chinese shares into a wider sell off) or HSI will rebound soon, re-joining the bullishness of US markets. STI will follow suit once a decisive move is made. 7. Which industry and sectors are you currently looking at and why? 1. Strength of Oil price – At Oil price above 70 USD, Oil related counters, including those relating to deepwater drilling, could be profitable as we emerge from the Oil crisis of 2015-2016. 2. There is some relative technical strength across the Big Caps globally in this sector, including rig-related players like Transocean and Petrobras. Similar technical strength surfaced recently in the larger Singapore Oil companies, like Keppel Corp and Sembcorp Marine. However, if the technical situation changes, then the bets are off - “fluid” concept re-emphasized. 8. What is your day to day strategy towards investing or trading? i.e. a top-down or bottom-up approach for stock picking? If there are no new “news”, ie. analysts upgrades or downgrades, no major announcements by the company or any other major news reporting, then technicals will decide the day-to-day strategy. If there are “news” reported, then we have to look at the content of the “news”, and the market response to the “news” vis-a-vis our internal scoring of the “news” (i.e. our expected price movement arising from the “news”) before deciding if there is an opportunity to trade / to ride on news / to exit. Technicals will still continue to form part of the analysis even when there are “news” being reported. 9. How do you manage your portfolio, passively or actively and elaborate on it? Market movements are fluid, and fundamentals and technicals do change from time to time. We receive lots of signals both in fundamentals and technical daily, it is up to us to use them to our advantage. There is no need to trade on every signal; trade only when that signal is significant one, be it fundamental or technical, or both, and that you are able to use this signal to gain an edge in your trading. 10. If you can go back in time to change one mistake about your investing/trading journey, what would it be? As mentioned earlier, there is no worst mistake as every mistake is an opportunity to learn, to trade and invest better for the future. Those “mistakes” are invaluable lessons that will yield great returns in the future – if you have the right mindset to learn from the past mistakes. If there is anything that I would like to do if I could go back in time, I would want to have started my investment journey much earlier, given that I only started it when I was 27. 11. Last but not least, what advice would you give to new traders or investors? Be humble, be willing to learn from mistakes, be open-minded and discover yourself. Your best trades will come when you understand yourself and when you find the best way to express yourself using your own strengths to compete in the challenging stock market. Do not blindly follow any gurus as you may not have the same personality, the same strengths as your investment idol. Do understand your weakness and avoid the potential pitfalls in managing your trades and investments.